A bit of a lull with the car at the moment due to work / family commitments etc. Have'nt done much apart from replacing a faulty Coil Pack. 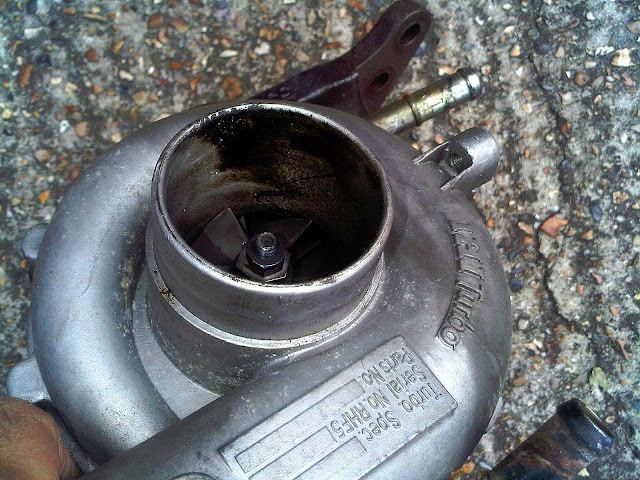 The reason for this was that the current VF37 on the car was a bit suspect. Struggling to hold boost, very late spool (peak boost at 4600rpm), late peak torque & recently getting rattly at certain revs, lack of power & smoking quite a bit of blue smoke. Old VF37 (sleeve journal twin scroll turbo as on JDM Sti's) now removed & showing signs of oil seal leak & a little too much play in compressor wheel,....all as suspected. But the turbo will live on with Mikee Singh (Qtr mile King of ScoobyClinic) who will use the twin scroll exhaust housing for his new SC46 Blouch/Scoobyclinic twin scroll turbo. A good choice for me to carry out the work was at DSA Automotive in Aylesbury, mainly due to the fact that they have one of the best Dyno Cells, with perfect temperature control. Also they are a reputable garage to do the turbo swop on site, 30 mins from my house & Iv dealt with Dave from DSA before. 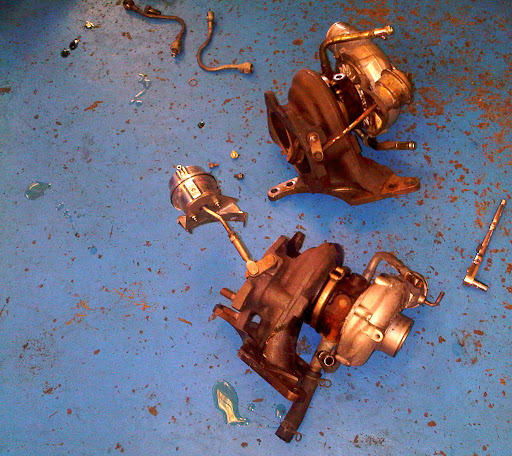 So in the morning the turbo was duly changed, Forge actuator swopped over & car road tested & checked over again. (While I sat and read through all their magazines & drank all their coffee in their customer lounge!!) 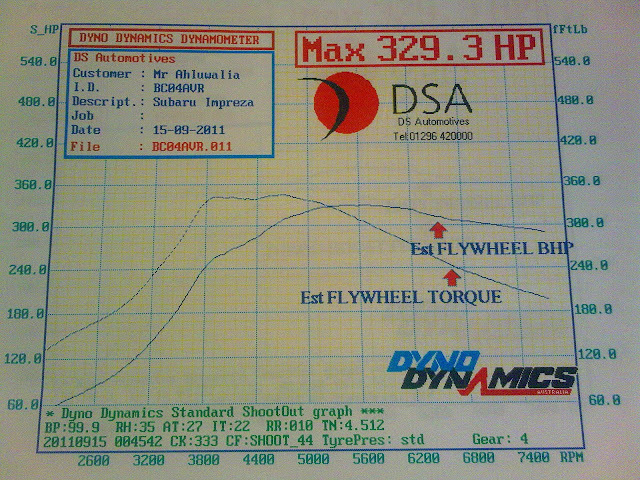 Just finished in time for Duncan to arrive & within 15 mins started mapping on the dyno. The map tweek took 45mins, a little longer than expected as the old turbo was running & mapped quite differently due to the issues it had with it. The car is running awesome now, quick spool is where its at with newage JDM's, along with good torque starting early & over a wider rev range, this coupled with the JDM 6 speed box, DDCD auto diff & super quick rack now makes this a great everyday drivers car. Last edited by rickya; 21 September 2011 at 11:08 AM. well done Ricky, you finaly happy? 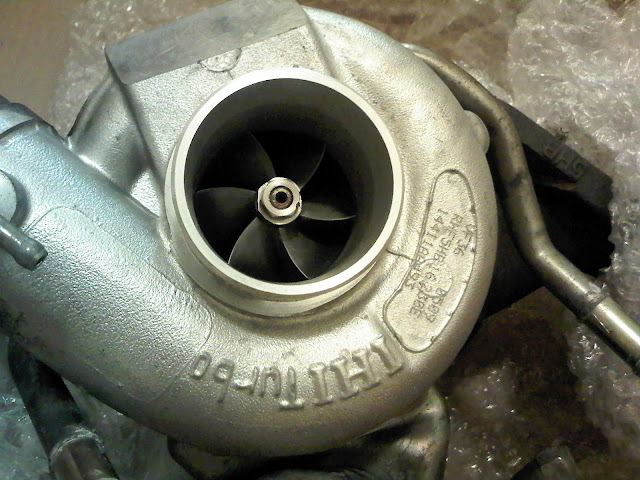 Glad its all finally sorted now and at least the turbo now has a new home. If you had the car re-run in "better" environment conditions, you should see an increase in power. It's looking like you're losing power at the top end due to the TMIC and heat, as it dies on it's **** from 5600rpm. For information my old 2ltr SPEC C (with the VF36) made it's peak power at 6500rpm on two different DD Rolling Roads. Thanks for your insight in this specefic area Shaun, there is hardly anyone else on Scoobynet with more in depth, accurate information on this type of car/setup. -What did'nt help was the car was running for a good 30 mins prior to it going into the dyno while testing the turbo installation etc properly. -Also I am not running any undertray on the car & have read that this can distort the airflow & air pressure going through the TMIC? Ah well.....looks like a Harvey GT2 FMIC & CAIK may be on the cards,.....& not forgetting the map tweek & dyno session.......again! Last edited by rickya; 21 September 2011 at 11:12 AM. This has been one of the reasons imo, why TMIC cars seem to show more BHP at PowerStation then they do at other venues. I would suggest this is purely down to the "better" air feed for TMIC users using PS's set-up, and not a sign of inaccurate measurement. 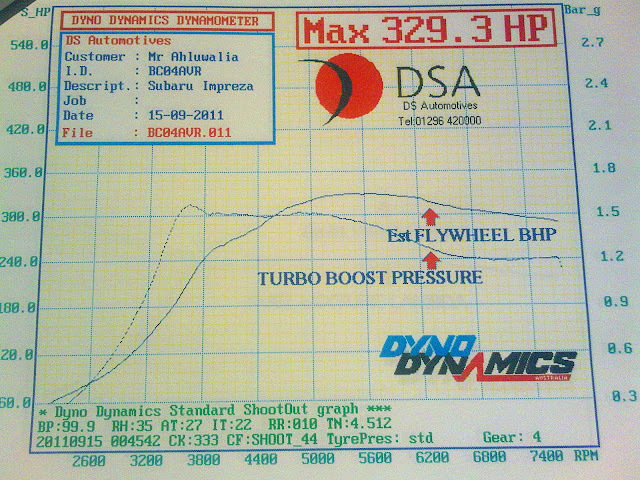 It's still not as good as you would expect on the road, but is certainly better at PS than most other dyno's. Continued running of a TMIC car on any dyno will increase heat build up..... even in a really good dyno cell as you just don't get the air volume around the car, like on the road. I always found at PowerStation when I did all that development work years ago (on the original SPEC C set-up), that when the mapping was done on each occasion the car was left to stand for 30mins - 1hr (obviously with the engine off lol) and then re-run for a graph comparison. Not a good idea to run without the undertray with the TMIC in place. You will be effecting the airflow to the TMIC, because of the pressure difference with the undertray not present. Personally I would try and locate an undertray and not bother with FMIC & CAIK at your level for road use...... unless you decide to change turbos and go for 400+. 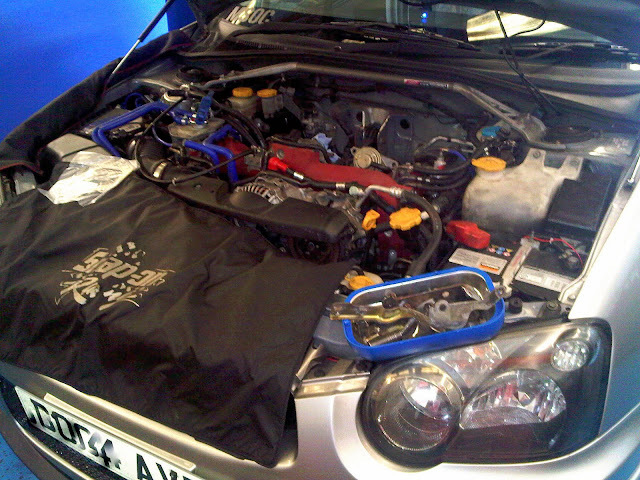 Looking good mate - give me a shout when you want the FMIC fitted and I'll give you a hand. Just do it Ricky go for 400!! Oh he did not submit the correct form again. Go out in one and then tell me you still can't be without the scoob.